Significantly, they expect these to arrive smoothly and seamlessly, in consistent high quality, and with no embarrassing freezes, black or silence. When playout suites had a staff member to deliver each channel they set the quality bar high and if you want to be taken seriously now - as a broadcaster or as a live streaming service - then you have to match those expectations. The key point is that we are moving to a multi-channel, multi-platform, multi-delivery world where broadcasters have to support many channels not just one; where digital broadcasters are fighting for a share of the audience; and where new content companies are looking to add to the choice by streaming content. So those standards have to be maintained in a highly competitive environment. The solution, of course, lies in our move from realtime video and audio over SDI to digital files and delivery over IP. It means we can achieve the scale we need by virtualising all the processes and running them as virtual machines, either on premise, in a data centre or in the cloud. If that sounds familiar it is because a lot of people are saying it and, indeed, it is the obvious way to go. The problem is that, just because plenty of people are saying it, it is assumed that it is easy to do. It is still a real challenge. Which is why I want to talk about the demonstration on our booth at NAB this year (we will be doing the same and more at IBC in September). We staged then what we firmly believe to be an industry first: true live playout in the cloud, with all the functionality that you expect for a premium channel, using our StreamMaster virtualised playout software and Gallium scheduling, asset management and automation system. All the software was hosted by Amazon Web Services, including content servers, master control, switching and - this is important - realtime 3D graphics. But this was a live, premium channel, so it needed monitoring and control in the broadcast control room, or NAB booth in this case. That included a manual presentation switcher so we could show a real premium channel going into and out of live events, with minimal latency. The StreamMaster cloud software incorporated the Pixel Power Clarity graphics engine and did what a physical Clarity does at the many broadcast playout centres around the world where it is installed: it inserts live 3D graphics and DVE moves in real time. It draws on templates to automatically generate marketing and branding content, and it provides squeezebacks and transitions where they are required. But in the demonstration it was doing it in the cloud. What is the significance of the demonstration? It proved that StreamMaster can provide real-time, full functionality playout facilities from within the cloud. Whether that is to provide disaster recovery for tier one channels or to create professional and seamless delivery for new pop-up streaming services, it is practical today and already running right now. In the couple of months since NAB we have put proof of concept systems in place for real users. 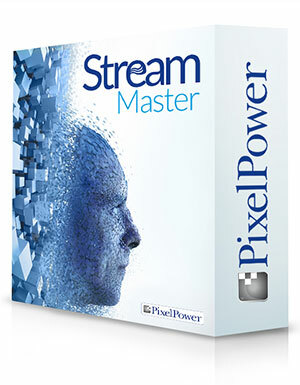 StreamMaster is a genuinely transformative solution. All the elements are software, which allows for a capex or opex business model. For a week's worth of AWS storage and processing for the NAB demonstration we paid only a few hundred dollars. That is for a premium channel with no compromises on functionality. So any broadcaster or content provider that wants to be taken seriously can achieve it with low opex too. I am sure that other vendors will be developing comparable solutions, although none will be able to provide the same single source solution which incorporates full broadcast-quality graphics. We have done it, not just for show but in the real world, and demonstrated that the future of cloud playout is real (not virtual) and is ready to roll.